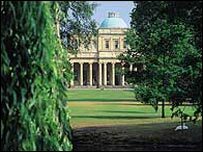 The famous Pittville Pump Room in Cheltenham will be retained for public use, it has been announced. The borough council will lease the listed building out to a private firm, which will retain it for use as a cultural and music venue. It will also continue to be used for weddings, meetings conferences and exhibitions, and banqueting. Councillor Diggory Seacome said: "The Pump Rooms are not to be sold off or used as a hotel, casino or restaurant." He added: "Local amateur societies will still be able to use the jewel in Cheltenham's crown at concessionary rates as they have enjoyed in the past." Cheltenham's Lib Dem MP Martin Horwood said: "The Pump Room has provided a focus for public entertainment and leisure for the best part of 200 years. "I welcome the council's assurance that it won't now be turned into a private venue like a hotel but will remain for community use." The Pump Room is a grade I-listed Regency building.